During recession, organizations are forced to cut their costs and while doing it, they sometimes unknowingly break basic rules. There are three basic rules regarding costs which are to be followed while taking important decisions. These rules help an organization in cutting the costs without affecting its capabilities in the long run. Usually long term payoffs are forgotten while taking cost cutting measures since they are not crucial for immediate survival. And when such thing is done it adversely affects the long term working of the organization. These basic rules which provide a practical and effective alternative to the usual cost cutting methods are described below. The cost of quality (Fig 1) is the cost of doing an activity and achieving the targeted results of the activity. It consists of two components namely ‘Necessary costs’and ‘Avoidable costs’. Necessary costs are required to achieve and sustain a defined objective or standard of work. These are those costs which are needed to carry out an activity efficiently and to achieve and sustain a defined standard of work. Avoidable costs occur whenever wrong things are done or things are done wrong. Necessary costs include prevention and inspection costs. Avoidable costs include some part of inspection costs and failure costs. 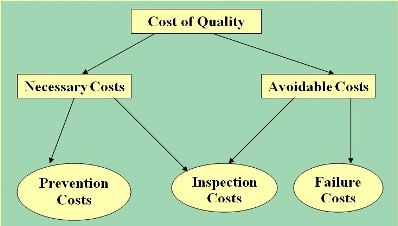 Necessary costs include prevention and inspection while avoidable costs include failure costs and some inspection costs. Prevention costs of any actions are the costs intended to make sure that things will not go wrong. Inspection costs are the costs of finding out if things are going on correctly so that in case of a deviation corrective and preventive actions can be taken. Avoidable inspection costs are also those costs which are incurred on inspection after the failure. These costs will be incurred whenever inspection is needed because wrong things are being done or things are being done wrongly. Failure costs are the costs incurred when a customer is or will be dissatisfied. In such case one pays the price in damaged reputation, rework, waste, legal penalties, special charges or loss of pride. The cost of failure is always huge and bringing back the things to normal conditions need a herculean task involving cost at each step. Identifying the necessary and avoidable costs of an activity is the first step towards reducing these costs. Example of the necessary costs are raw material cost, cost of maintenance etc. Any saving in the necessary cost becomes counterproductive and results into expenditure somewhere else. An organization should not try to save big money on the necessary costs. All the savings should be carried on the avoidable costs. For reducing the cost, managers should communicate their priorities and expectations to the employees. They should also facilitate the improvement process by making sure employees are involved and have the confidence and skills required for the job. Managers are also responsible to ensure that the employees are not only doing all the things right but also doing the right things. Each employee should take up the responsibility for doing the right things. Generally the employees have the ability to judge what the right things are, but they cannot make decisions about right things in vacuum. The employees should have the confidence to discuss with their customers and their manager to understand the needs of the customers and the organization. The costs of carrying out an activity have two components- namely ‘visible costs’and ‘invisible or hidden costs’. For taking a decision one has to keep in his front both the types of costs. When an iceberg floats in a sea then only a small fraction of its volume is visible to the ship captain. The major volume/weight of the floating iceberg remains under the sea water. Any incorrect judgment by the ship captain can result into the ship facing the same fate as the Titanic has faced. Costs of an activity considering only the visible costs may be highly misleading.Visible costs are normally a small fraction of the total costs and are similar to the small area of the iceberg which is visible while it is floating in the sea. Decision taken, considering only the visible costs, usually ends up in huge escalation in costs afterwards at the time of completion of the activity since the effect of invisible Costs are usually similar to the hidden part of the iceberg. While taking a decision for carrying out an activity, it is also necessary to consider the hidden or invisible costs so that overall costs of the activity at the time of completion can be reduced. For example while purchasing refractory the visible cost is per ton or per volume cost of the refractory. But in case refractory does not meet the lining life requirement then the costs involved will not only the additional cost of refractory replacement but it will also include production loss cost due to the lower availability of the equipment. Several examples can be given from the working of steel plants or from the daily life of an individual. This rule states that if a problem is not fixed when it occurs, it will only become more costly to fix later both in terms of money and time. If the cost involved is 1 while catching and fixing the problem in the initial stage, then the cost of fixing the problem becomes 10 times if it is neglected and allowed to reach the next stage. The time for reaching the next stage will depend on the type of the problem. If still the action is not taken and the problem is allowed to reach third stage then the cost of fixing the problem will be 100 times. 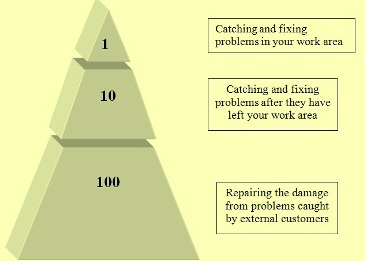 The cost of fixing the problem increases by ten times in each stage. There is one shining example for this in one of the steel plant. A problem had happened in the Coke Oven Battery and it got suppressed due to some reasons and action for fixing it was not taken. If the problem was fixed at that time the cost involved would have been in the range of Rupees 25 millions. But this problem was allowed to reach the stage three and it had threatened to stop the complete production in the steel plant because of the adverse gas balance. At this stage the problem was fixed and the cost involved was in the range of Rupees 2500 millions. This rule is shown in Fig 2. The following of the above basic rules regarding costs means giving improved performance with lesser costs. Many examples can be given in all walks of life including the cases in the industry regarding the utilities of these basic rules. Organizations following these rules move forward faster with fewer mistakes and support the organization’s efforts toward continuous improvement.